The Ohioana Library Association was founded in 1929 by Ohio First Lady Martha Kinney Cooper to collect, preserve, and promote the works of Ohio authors, artists, and musicians. By the early 1930s the Library had outgrown its space in the Governor’s Mansion and moved into the new State Office Building at 65 S. Front Street, where it remained until 2001. Ohioana and the State Library of Ohio then moved to the renovated Jeffrey Mining Corporate Center near downtown Columbus. Today the Library’s holdings include more than 45,000 books by or about Ohioans; 10,000 pieces of sheet music; biographical files on notable Ohioans; personal papers of Ohio authors and artists; and numerous scrapbooks created by Ohio civic and cultural organizations. The collection does not circulate, but is available for in-library use. The Association is a 501(c)(3) tax exempt, not-for-profit organization governed by a Board of Trustees composed of up to 28 members from throughout Ohio. It is supported through memberships, subscriptions, contributions, and a subsidy from the State of Ohio. Members and subscribers live in 36 states, the District of Columbia, and three European countries. 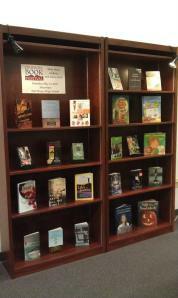 You can visit the Ohioana Library in person at 274 E. First Avenue, Suite 300 in Columbus, Ohio. See our Contact page for information about planning your visit.